Blair is now slowly becoming a thing of history- as are many of his closest advisors and ministers. Not to mention the fact that the Brown accession looks much more troubled than it used to, with many commentators beleiving that Brown may only remain Prime Minister for a couple of years not a couple of terms. Slowly the controversies that used to dog the body politic are becoming a thing of history and new controversies are arising in their place- but that leaves us now at a point where we can begin the long business of assessing Blair, Blairism and New Labour as phenomena. Ross McKibbon has begun just such an assessment in the London Review of Books. I find much that he says convincing- new Labour has not been as focused on equality as previous Labour governments and has presided over an uneasy synthesis of Thatcherite economics and increased public spending. There have been some rather spectacular errors- the invasion of Iraq, both in its planning and its execution, has not been a success by any terms. The Blair government has seemed to be too close for much of the electorate or indeed any party in the political spectrum's comfort to George Bush and the Republicans in the United States. What Britain has gained for its close adherence to American foreign policy is not clear- Britain's diplomatic clout is not obvious and for many Sir Christopher Meyer's portrait of Blair as a starstruck teenager worshipping power has become more and more convincing. There have been successes as well. People underrate how Blair has helped the country become more liberal, more accepting over his years of power. 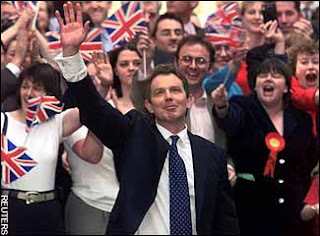 Economic success, born of luck and continuing Tory economic policies, has been a feature of the Blair years too. Perhaps most emblematic has been a difficult relationship with the two chief dissident forces within the state- the judiciary and the civil service. Blair has appreciated the role of neither and seems to regard all professional bodies and groups with a degree of scorn only matched by his close predecessor Margerate Thatcher. All in all as Blair's reign fades out towards the sunset- his retrospective will be written by more and more individuals. My own sense at the moment remains confused- and this piece therefore is confused. Dr McKibbon has begun a work I fancy which it will take years and many hands to finish. I agree with McKibbon's article. I think the Blair government has been a missed opportunity. With 3 consecutive electoral victories, Labour had an opportunitry to make significant changes. It did not. For example, on the distribution of income and wealth in society, the period 1979 - 1997 saw it grow to a level not seen since Edwardian times. Although, there has been some reduction in the level of relative poverty since then - the figures remain much higher than in then 70s and much higher than in many other developed countries. The government has also tried to 'reform' health and education in a very market-based way. This, to my mind, has set a dangerous precedent since any future right-wing government could build on this to lead to future privatisations of the system. There have been other missed opportunities. The government could have reversed some of the privatisations of the Tory years, such as rail privatisation - which remain unpopular with the public. It chose not to do so. Furthermore, a 10-year period which has seen houses become more and more unaffordable, points to another missed opportunity of the Blair years. The 80s saw the selling off of council housing. A positive move that Labour should have done, on coming to power, was to encourage councils to build more. There are 1.5m people on council waiting lists and they are in need of a good place to live. The government, given the economic boom we have had and low interest rates could have borrowed and given grants to councils (or let them borrow on the open market) to fund such a construction programme. People underrate how Blair has helped the country become more liberal, more accepting over his years of power. In what way do you say he's done this? I can't say I particularly feel any more or less liberal and accepting as a result of any government action, and the idea that making David Blunkett, Charles Clarke or John Reid Home Secretary has done much to liberalise things seems a bit contentious. There are certainly individual reforms to which one can point -- civil partnerships, for example -- and one could just as fairly say that the Conservative opposition helped the country become more liberal by (in the main) supporting civil partnerships. To my mind, though, this was an example of the politicians following, rather than leading, public opinion. In general, as McKibbon's article suggests, the government has been increasingly illiberal over crime and immigration, and now with ID cards. The one really liberalising measure it's introduced -- the Human Rights Act -- is one that it clearly now regrets and which is the cause of so many of the clashes with the judiciary to which you allude. I think one has to break down the suppoosed closeness to Geroge Bush and the "Republican party" into indivia policies. The only real example is iraq-and I think it's very wrong to see this as delibeatley closeness. Blair has been pro iraq war for years and it fits in very well with his very aggresive and moralistic foreign policy - he was in favour in principal. The reason why Britain has not gianed much from this (insofar as is true) is that Blair has not been bothered to ask for help for the Britsh national interest, he prefers to ask (and exercise real effect) on such will o wips as Isreal-Palestine peace agreement asnd some kind of global treaty controlling carbon output/ growth. I wouldn't call it "economic sucess" either I would call it "lack of economic disaster" (whic is genuinely different from every post-war labour governmetn and most tory ones) however comparative economic growth and competivienss is falling in the UK compared to other countries- if you comapre te UK's economic record with ireland for example under Blair, it's very embarassing. Finally on the public professions- I'm not sure one should talk in such a general way about either his attitude or Thatcher(did Thatcher have a "degree of scorn" for the armed forces) . ON the two specific ones I think it's complicated. On the Civil Service I think his actualy much more scornfull than Thathcer- the purge of senior civil servants under blair and the scale of laboupr party figures brought in easily dwarfs any such measures under Thathcer. ON the judiciary I think Blair's legacy is much more complicated on the one hand he has railled agianst them rhteor4icaly. on the other hand though the human rights act he has given them unprecedented powers- which they have used to the full with his clear cooperation. Brian has moved away from represenaive governn in the direction of government by court which is powerfull in the US , Canada or Isreal- and Blair has done more than anyone to make that happen. I think all of you have provided useful correctives to my post- Not Saussure I agree with you about illiberal terrorist laws for example. One of the problems of summing up an era late at night in two paragraphs is that you make a lot of mistakes- I did and I think all your posts point out good aspects of that. I think on the more accepting point might be something where I've taken my personal history to represent national history- because I've grown up under Blair at times I imagine that Tories were my teenage years whereas Labour is my as an adult- that's my explanation. You've probably posted about it already Henry, but have you read Simon Jenkins new(ish) book? I think you'll find it a useful lens to analyse the Blair administration through. The question of how you describe economic policies is an interesting one as well. One could argue that it is a continuation of Tory policies, but it might be then important to reanalyse the myths around Tory policies, if only because the vast majority of jobs created under New Labour have been in the public sector and there's been a level of public spending that makes people like John Redwood really unhappy. Of course the ongoing privatisation projects and bribing large firms with juicy privatisation contracts, plus the general kow-towing to The City on all sorts of matters is entirely of a piece with the Tory era. Sorry, but lots of drivel written here by the commentators. In what way would you call the current economy a success. Pension provision ruined, more poor people than there used to be, growing unemployment, off balance sheet PFI debt that will sink future generations, extra taxes tkaing us to the highest level of any major economy, falling productivity in the public sector, core inflation rising, interest rates rising, an asset bubble in house prices ticking along. The future is now stuck in higher taxes combined with lower government spending. It is a disaster IMHO. cityunslinker surely you're not talking about me? ON vilno S's point incidnealy surely the key thing is new houses rather than new council houses insofar as housing costs are concerned? Anonymous I haven't read Jenkins's book though having had your reccomendation I may well do so. But I think what you generally say is true. City Unslicker I suppose what you can say about Blair is that short term there has been a lot of prosperity- now what that has stacked up for the long term prospects of the country is a different matter. I wonder if in economics his reputation might be something a bit like say Macmillan- a man under whose rule people were prosperous but who bequeathed problems to the future.